Outlets report no one has heard from the ARA San Juan or the 44 crew members aboard since Wednesday. Authorities are stepping up search efforts after an Argentine navy submarine vanished earlier this week. 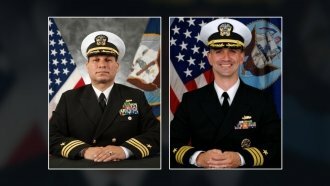 No one has heard from the sub, which had 44 crew members on board, since Wednesday. Communications reportedly went dark while the ARA San Juan was returning to its home port from a city in the southern tip of South America. Argentina's navy dispatched three ships for the search. According to The Associated Press, several countries have pledged to help with the search, including Chile, Uruguay, Peru, Britain and Brazil. The U.S. Navy deployed a P-8A Poseidon, an aircraft designed for anti-surface warfare and surveillance missions, to the area. NASA also sent a research aircraft, the P-3 Orion, to search the seas for the missing submarine since the plane was already in the area. Officials said if a submarine has a communication problem, it should surface. But rough weather in the South Atlantic is reportedly posing a problem. CNN reports the ARA San Juan is due back at its destination on Sunday.